The Best Way to Get Free Nike Shoes Every Few Months as a Nike Tester! You are here: Home / Free Stuff / The Best Way to Get Free Nike Shoes Every Few Months as a Nike Tester! So, you want to test some Nike shoes? Nike has been one of the biggest brands of shoes, especially for athletes, for decades and continues to impress with its high-quality shoes. Of course, to continue to be a leader in the industry, Nike needs the help of people who actually wear their shoes. This is where product testing comes into play. Real people like you can get chosen to wear Nike shoes – for free! – in exchange for providing your feedback. You’ll also give your shoes back at the end of a specific period so that Nike can evaluate their wear. 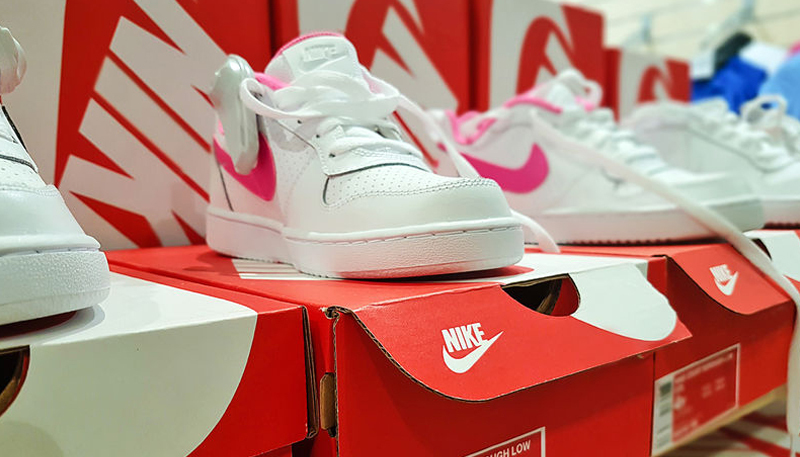 The whole process ensures that Nike stays on top of its game in providing some of the best shoes for athletes and fitness enthusiasts all over the world. If you’re a fan of Nike already, then you won’t want to miss this opportunity. And, if you’re an athlete of some kind, then you may be the perfect choice for product testing! Want Free Nike Samples? Start Testing! Nike actually has a few different kinds of testing opportunities available. Whether you want to be a football boot tester or try out some new Nike clothing, you can find the right testing panel for you. Nike even has a product testing panel dedicated to kids who love Nike too! You can find out more about the program on the Voice of the Athlete Nike Product Testing website. But, I’m going to also give you a rundown here of the programs and what to expect to make your research a little easier. Remote testing opportunities for Nike are definitely the most popular. These opportunities let anyone who qualifies in the United States test Nike products from their home, doing what they normally do every day. For remote testing campaigns, you’ll receive a pair of shoes for free by mail that match the type of activities you’re involved in. If you’re a runner, you’ll get running shoes. If you play baseball or football, expect to get some cleats. Remote testing opportunities with Nike let you keep the shoes for longer than you would doing on-site testing. Most of these campaigns range anywhere from several weeks to several months, depending on Nike’s needs at the time. When you’ve completed the testing period, you’ll send the shoes back to Nike at no cost to you. This, as the name suggests, requires you to physically come to a Nike testing facility to test shoes or clothing and give your feedback. Unlike remote testing, you’ll only spend a few hours at the facility when you do on-site testing. Nike doesn’t offer a lot of information about whether you’re compensated with anything to do this, so this is something you’ll need to ask about if you get accepted. On-site testing will typically require you to wear shoes or apparel while at the facility and provide your honest feedback while you’re there. This is more of a focus group setting instead of the day-to-day testing you’ll do with remote testing. But, it can be fun for those who live close to a Nike facility to check out the inner-workings of the company and find out about new products. When you apply for Nike product testing, those who look over your application will determine if you live close enough to a testing facility to be eligible for on-site opportunities. If so, the company will let you know when you get accepted, and new opportunities arise. Nike has three different types of testing programs available: shoes, apparel, and kids. As far as I know, both shoe and apparel testing can be done at on-site locations, but kids’ testing is remote only. To test Nike shoes, you’ll need to qualify for a current campaign based on things like your athletic activities, body type, etc. Each of Nike’s campaigns requires specific criteria, and they choose panelists accordingly to make sure they have enough data from testers for every piece of information they need. Most programs last about three months. That means that, once you receive your shoes for free from Nike, you’ll have three months to wear them during your athletic activities. Nike will detail how often you should be wearing your shoes each day, week, etc., so that they can evaluate them accurately. Once your time is up, you’ll send them back to Nike using prepaid shipping materials. Nike then evaluates the wear and tear on your shoes. The information they gather goes toward helping the company shape the future of their shoes and keep improving their products. Nike apparel testing will involve you testing things like jackets, shirts, shorts, and other athletic wear from the company. These programs typically won’t last as long as the shoe programs. Instead, they’re designed more for your feedback than an actual evaluation of the products when you’re done wearing them. You won’t get to keep any apparel after you’ve worn them. You’ll ship them back to Nike as you would your shoes. Something great that Nike offers its testers is the chance to get kids involved too. With a parent’s permission, kids 12 and under can participate in the kids testing program. This program is best for kids who are involved in some type of sport and are very active with it. According to information online about the program, kids wearing infant through youth sizes can have their parent sign up to be a Nike tester. However, there seem to be more opportunities available to grade schoolers actively involved in sports and fitness. Kids, with the help of their parents, can provide their feedback to Nike for the duration of the program. Then, you’ll ship the shoes back to Nike for free once the program is over. Now that you know what testing programs Nike has available, let’s go over the requirements and application process. Nike doesn’t offer a lot of information about its program on the website. It seems like most people apply to test without really knowing what the requirements are. The application can be lengthy, so it’s helpful to know what kind of people Nike wants before wasting your time. The Nike Product Testing website is where you’ll want to go to apply to become a shoe or apparel tester. Nike does accept some people from outside of the United States, but not all countries are accepted. To find out if you’re eligible, you can email test.apparel@nike.com for the information you need and to get an application. Once you’re accepted as a tester, Nike will let you know the next steps. Generally, you might need to wait a while before a testing opportunity for you pops up. When it does, Nike will notify you, and you can choose to accept or deny it. During the testing period, you’ll need to submit feedback to Nike via the website. Nike will send survey-like forms to you asking specific questions about the shoes, how they perform, and their durability. When it’s time to send the shoes back, make sure you do it by the deadline. If not, you could be responsible for the full cost of the shoes and Nike might remove you from the testing program. Nike also does an annual evaluation process of all of its product testers. The company will evaluate your performance on past testing opportunities. If Nike feels that you’ve been an asset to the team, you’ll be eligible for testing for another year. If, however, your performance isn’t where it should have been as a tester, you could face removal from the program. It’s crucial to follow the rules of each testing opportunity to a “T” to ensure that you can keep testing in the future! I’ve seen a few people mention that they’ve gotten compensation for product testing for Nike, although it appears that this may be for on-site testing only. Regardless, there’s no clear-cut information from Nike itself about compensation. For remote testing, the only compensation you get is the shoes or apparel you test. However, remember that these items will have to be returned at the end of the testing period. You might think of it like borrowing, then, more than receiving a freebie. Still, you can save wear and tear on your regular shoes while you test Nike shoes. And, if you do a great job with your test, you’ll be likelier to be chosen for future testing opportunities. It’s possible to have an almost continuous cycle of new shoes you don’t have to pay for, even if you don’t get to keep them for longer than a few months. Nike may be one of the most famous companies in the world, but it still relies on the help of its fans to make awesome products. Through the Nike Product Testing program, you’ll have a hand in helping Nike improve its products, from shoes to athletic wear! If you’re a Nike fan who’s also involved in sports and/or fitness, then this is an opportunity you won’t want to pass up. Have you applied or been accepted as a Nike Product Tester? Please leave a comment and let us know about your experience! 9 Best Ways to Become a Beta Tester and Get Paid to Play Games and Apps!